Q: I am trying to figure out my thread count for a woven towel project and I really don’t know what is meant by “plus the balance element.” What the heck is a balance element? Image courtesy Liz Gipson, yarnworker.com. A: Let’s look at basic design. If my threading pattern goes 1, 2, 3, 4, 3, 2, 1 (etc) and repeats (draw it out on graph paper), you’ll see that the next number in the pattern is 2; the pattern progression is pretty obvious. Draw out several repeats of it, and then draw in lines to isolate each “repeat”, and you will find that the repeat is 1 2 3 4 3 2, and that the next number, 1, really belongs to the next repeat. So if we are doing a stretch of this design, we’ll put in a bunch of repeats in the pattern, ending with a full number of repeats, and then throw in a 1 (balance element) to make the whole thing look coherent, ending where it began. Symmetry! So: in the case of Finnish towels (Davison, p. 197), my repeat is 38 threads; block A of 20 threads, plus block B of 18 threads. I’ll do those 38 threads as many times as I can (given the width and thread count I want), and then end with 20 threads (an extra block A) to visually complete the pattern and balance it out. 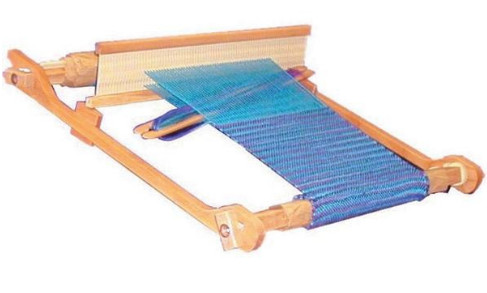 Q: Is it possible to add a third heddle to an Ashford Rigid Heddle loom? I have the 32" one. If not, is a heddle bar the same thing? 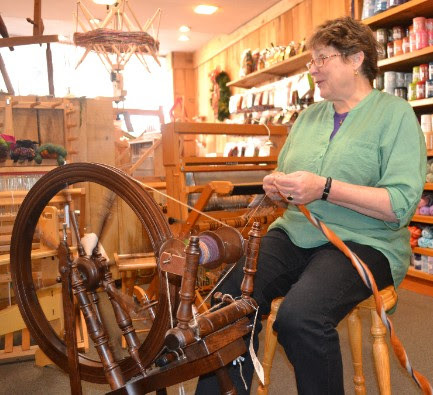 I'd rather have a third heddle if possible. A: Well, anything is possible, but it’s not optimal; there just is not enough room in that loom, front to back, for another heddle block to be added without impacting the performance pretty dramatically. The conventional wisdom is that the Beka is probably the only loom out there with enough depth to do a third heddle, and that has compromises as well; there isn’t a neutral position on the Bekas. A heddle bar isn’t quite the same thing; a RH will move the “hole" warp threads to heddle-up position or to heddle-down position; while a heddle bar is capable only of moving a set of warp threads to heddle-up position; there is no heddle-down capability. To do the same thing that a third rigid heddle can do would take a pair of heddle bars. Good thought, though!